The long-simmering feud between Cardi B and Nicki Minaj isn't dying out anytime soon. 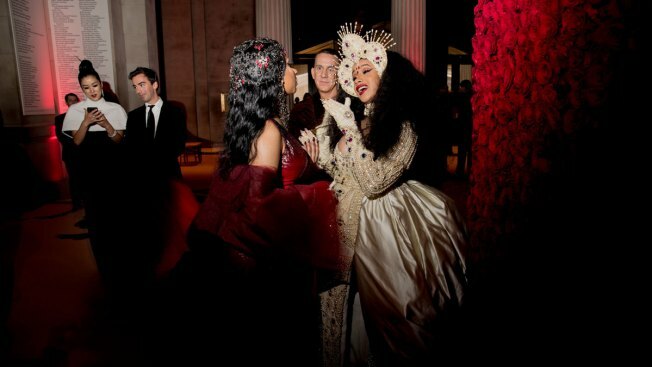 On Sept. 7, Minaj and Cardi got into a heated altercation during New York Fashion Week at the Harper's Bazaar ICONS event. Video footage showed the "Bodak Yellow" rapper throwing her shoe at Minaj and yelling at her. An eyewitness at the event told E! News at the time, "It was so fast! I heard someone screaming--everyone recognized Cardi's voice--people either got out of the way or took out their phones and started filming. Nicki was surrounded by a bunch of guards and barely even looked at her. Next thing you know, shoes were flying and Cardi was on her way out." Cardi was photographed leaving the party with a large bump on her head, which most people believed to be from security. On Monday afternoon, Cardi B uploaded 10 separate videos calling out Minaj and unleashing a new barrage of attacks. "Let's talk about the leaked numbers s--t, right. Tell me if this don't make sense. How come my phone number got leaked one hour after that altercation at the Harper's Bazaar party," she said in one of the videos. "How come everybody that y'all have issues with, y'all have the numbers in your camp and they numbers got leaked. My sister just got into an argument with Rah Ali, how come my sisters number haven't gotten leaked? Because y'all don't have it. How come my new number hasn't gotten leaked? Because y'all don't have it. Isn't that f--king funny? Ain't that s--t f--king funny?" In another video, Cardi urged Minaj to "pick a side" in their fight. "How you say that I was a wild animal, that I attacked you that you was mortified that you was humiliated playing the victim but now y'all the gangster," she said. "Pick a side. Do you wanna be the victim or do you wanna be the gangster? You lie so much you can't even keep up with your f--king lies." She added, "Miss Chun-Li, the street fighter. Get the f--k outta here." After Cardi's phone number got leaked, she got a slew of graphic and expletive-filled text messages from random numbers, which she showed in yet another post. After scrolling through her texts, she stopped on one specific one that stood out to her the most. It read, "Hey b---h I was texting you to tell you that you're [sic] address and everything was leaked and we coming to find you and your daughter. We ain't resting till we kill culture [sic], dumb b--h. We gon put more than a knot on your head this time c--t."
She said to Minaj in relation to the texts, "You go on your Twitter and you start liking s--t like endorsing that type of nasty a-- f--king behavior. B--h, you're f--king sick in the head." In one of her later videos, Cardi extended an olive branch...sort of. She declared to Minaj they could just put an end to this constant bickering. She asserted, "I'm tired of the interview s--t. If you really want to talk about it, you know where to link me, we could always link up. You know who to reach out, you know. We could settle I however you want to settle it, we could talk about it, or we could fight it out." Minaj has not yet responded to Cardi's videos.